If you’ve ever wondered what the doctors of Awesome Hospital do on their day off, then get ready to have your questions answered in a new story featuring guest artist Sheli Hay! It would be nice if Paul also had a law degree, so he could be Detective Doctor Paul Bulldog on a Skateboard, Esquire! I bet he’s also a forensic expert. Paul needs different skateboard for the various jobs though. Isn’t that one medical equipment? Sold. Seriously, check the ActionAge donations in 30 minutes. And I’ll be keeping careful notes so that I can get the most out of 2050’s Dr. Bulldog On A Skateboard R.I.P. storyline. This is the most awesome thing I have seen all week. Dr. Bulldog/Detective Dr. Bulldog on a Skateboard is now my favorite character. YEEEEAH! But who picnics at a skate park? For that matter, who goes to skate parks anymore? hmmm…a mystery is afoot. That would lead to envy from the runners up, wouldn’t it? And it would lead to further anger from former World’s Greatest Grandpas. Some of those folks never had much else in their lives. And who was the most recent winner, you may ask? Is Number One Grandpa sporting a Minor Threat patch on his arm there? He is definitely sporting a Minor Threat Patch – Good catch! You can thank the writers for that one. Prediction: #1 Grandpa was attempting to look awesome on a skateboard and flopped hard. The picnic had a knife in it, he landed on it, the end. I have to imagine the second panel in the voice of Jack Klugman, from Quincy: ‘It was moider! THIS! IS! SO! AWESOME!!! Grandpaaaaaahhh! Hopefully I’m not the only person who heard a dog growling out those Rs in his head. It made me smile. My favourite doctor gets more and more awesome with each strip. Remember years ago, when Warren Ellis was always on about Quincy in his Bad Signal mailings? I hope he’s happy now. It’s not just a mystery it’s an AWESOMYSTERY! Take that Scooby Doo! LOL! Technically, anyone can add “esquire” to their name for no reason. Originally it applied to anybody who worked for the royal government, which included lawyers and barristers, but it actually has nothing to do with that in paarticular. But remember, adding “esquire” is taking on a title of royalty, so it is technically constitutional treason! 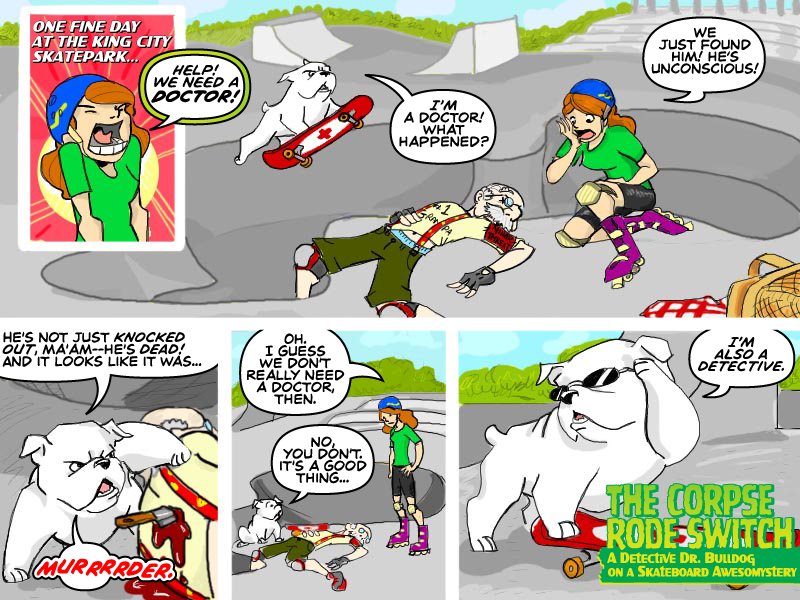 Captain Detective Doctor Bulldog on a Skateboard! Might be his name if he dabbled in military surgery. Possibly Major. A complete doctor’s degree translates to some officer’s rank anyway, if memory serves.